Staying organized is something that I love. 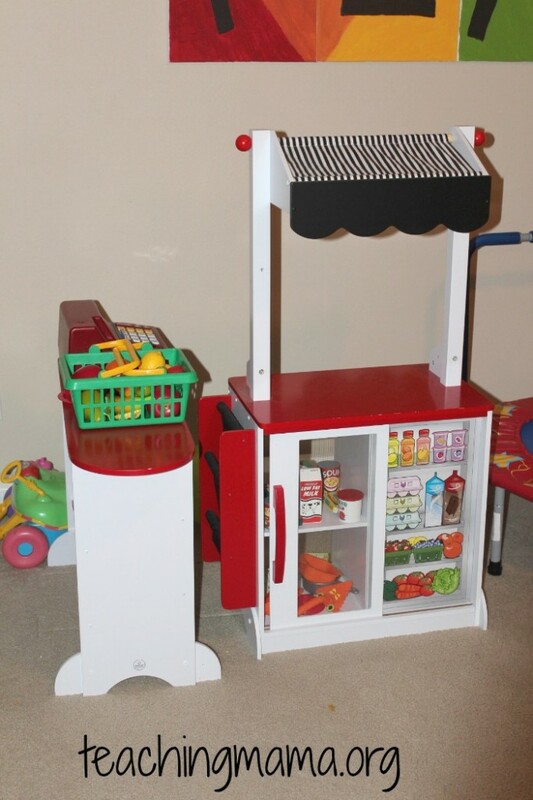 With three little ones, my house doesn’t always look super clean, but I feel amazing when my house is well-organized. Since moving into our home, our toy room has been a mess. We are very blessed to have a huge room in the basement for all the toys, but I didn’t have a great way of organizing it all. Last week, I finally got it all organized! 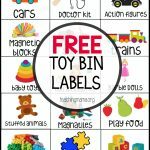 Today, I’m sharing how it turned out as well as a printable for our toy bin labels. 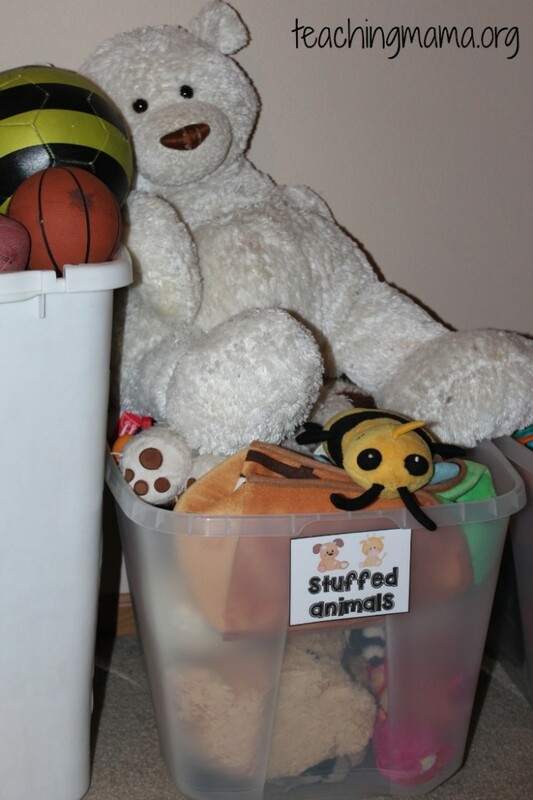 I sorted through the toys and separated them into plastic bins (from Walmart). I then made some labels and added them to the bin. 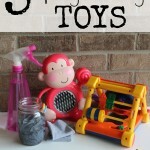 This has helped tremendously when it’s time to clean up toys. 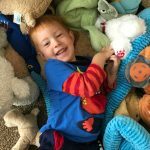 My kids know exactly where each toy goes because they can look at the label! I made this PLAY sign several months ago. I just took four 16×20 canvases and painted them with acrylic paint. 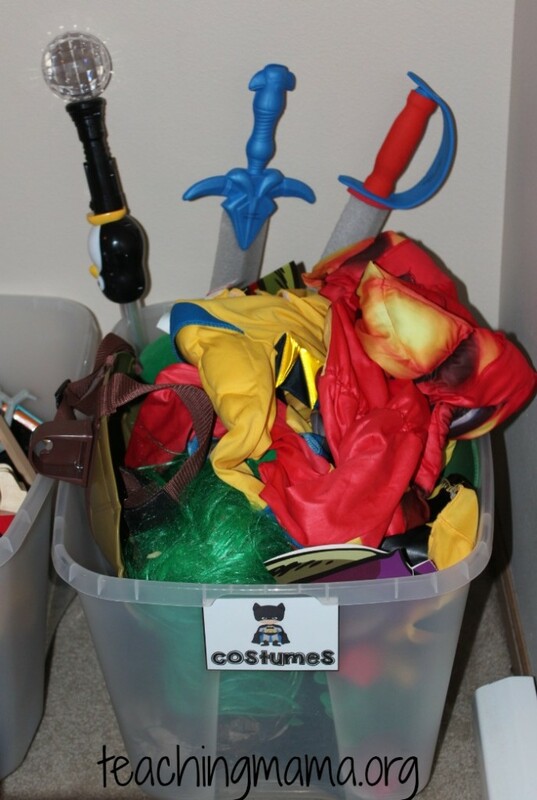 In big plastic bins, I organized large trucks, bigger balls, costumes & stuffed animals. The kids love the grocery store! 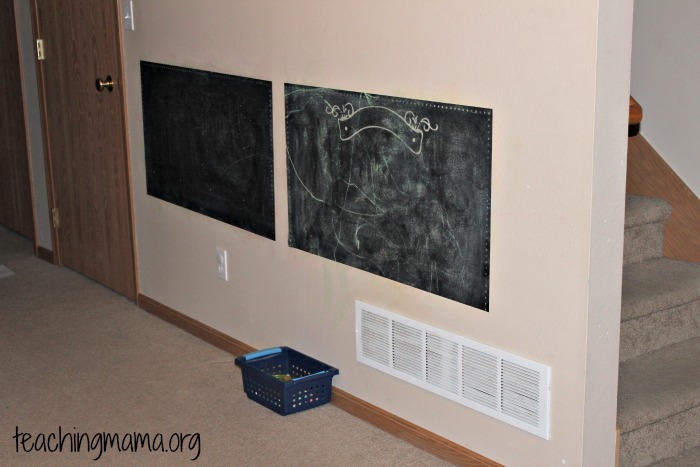 Here is our chalk wall. I have a small basket of chalk on the floor. That will be moved once baby is mobile! We also have a cozy book corner. 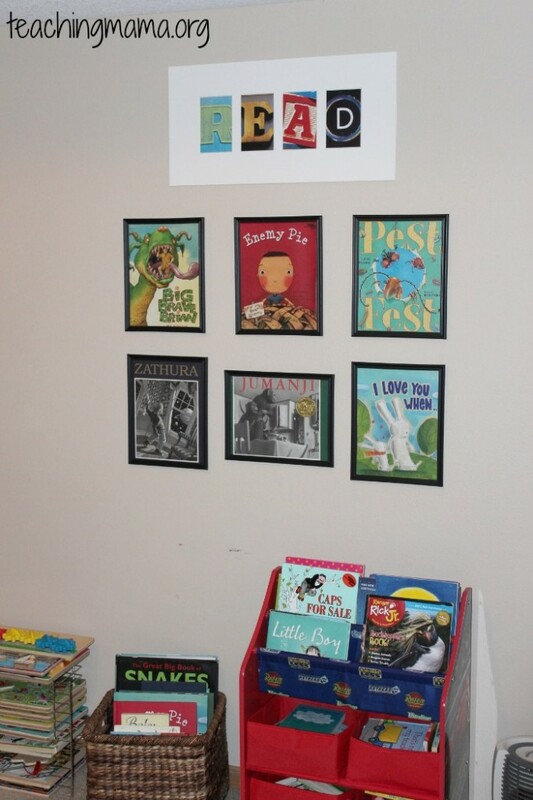 To decorate the wall, I took book sleeves from hardcover books and placed them in frames. Then I just added command strips to the back of the frames and stuck them on the wall. Simple! The READ sign was made from letter cards from Hobby Lobby and a frame. We have lots of books at our house. Here are just a few of them. 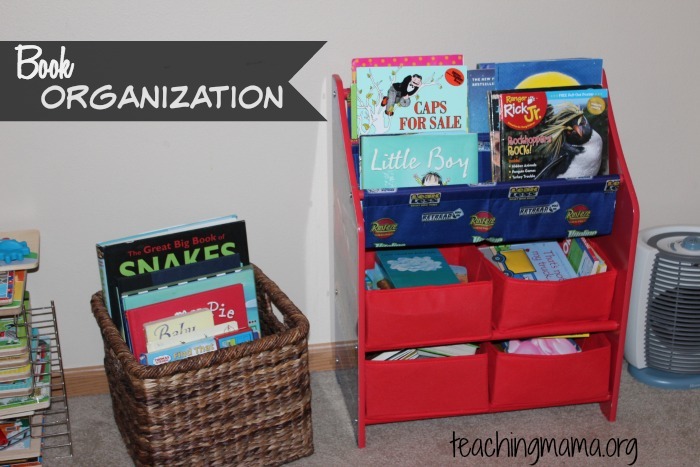 In the red organizer, I have fun picture books and nonfiction magazines. In the red baskets are baby books. In the wicker basket off to the side other kid books. And there is our play room! Hope you enjoyed the tour! It’s nothing glamorous, but it’s helped us stay organized. 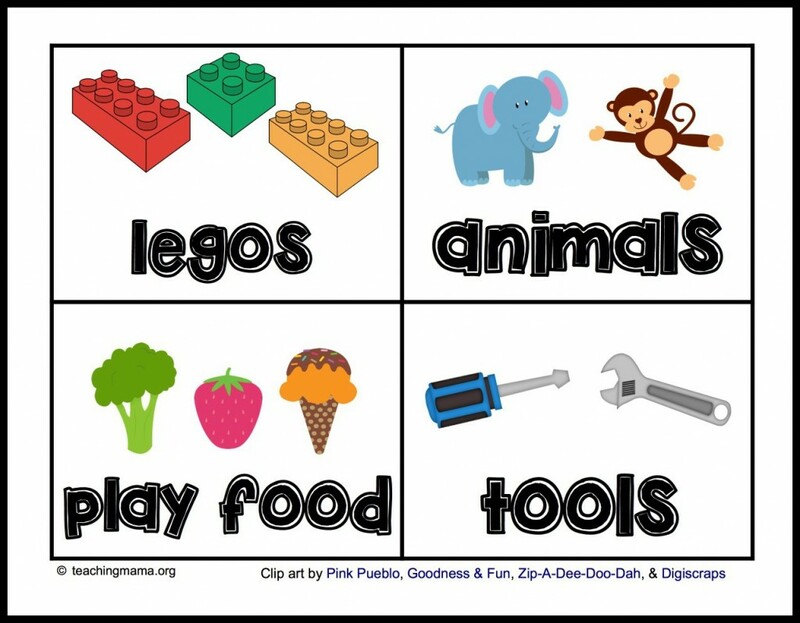 If you are looking to organize your play room, you may want to download the toy labels I created. Here are a couple sample pages. Let me know if you have questions! Happy Organizing! It’s gorgeous, Angela!! If you were a little closer I’d snag an invitation for a play date! Great suggestion!! I love the idea. Thank you, Bonny! I love hearing that! So fun! It should print for you. Make sure you have the most current version of Adobe Reader installed. You can do that here: https://get2.adobe.com/reader/ Or try using another browser. Let me know if it works! Is there a way to format this so I can print them onto labels? How did you do it? I have not experimented with printing on labels. If I figure it out, I’ll let you know! The font is KBDunk Tank and now the file is editable, so you should be able to make your own to match! Hi i seem to be having the same issue of not being able to edit the ‘Toy bin labels’. Can you please attach the editable verson web link? Ive already printed some but would like to have all labels match if possible! 😊 thankyou! Hi Keeta! I will send you an email. Thank you so much for creating this! 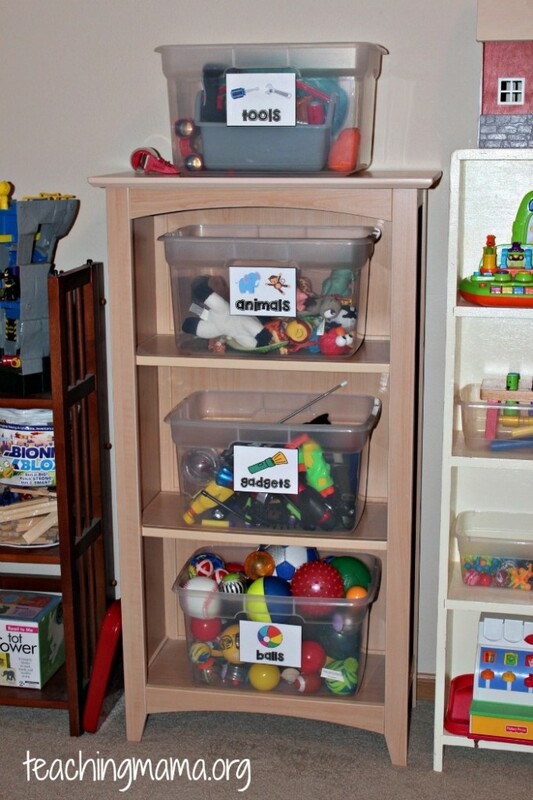 Just what I needed for our toy bins. I’d also love to know the font or have access to your template so I can make a few more to match (I’d be happy to share them back with you to add to your collection). Thanks! These are amazing! 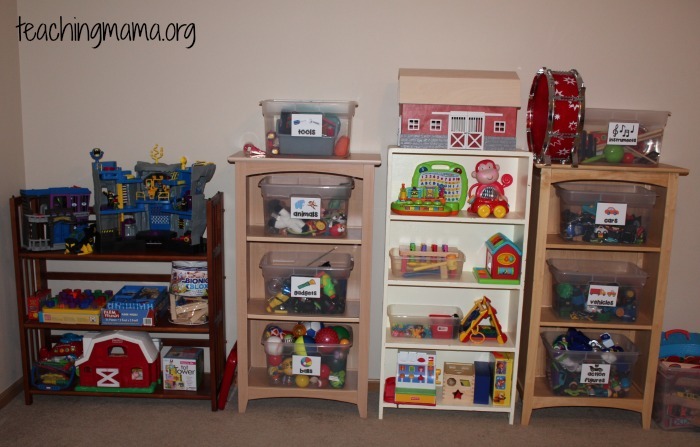 I am also a mom of 3 boys and without recent military move we are without a playroom and the toys are driving me crazy! Is there a way to add a picture to the blank ones? 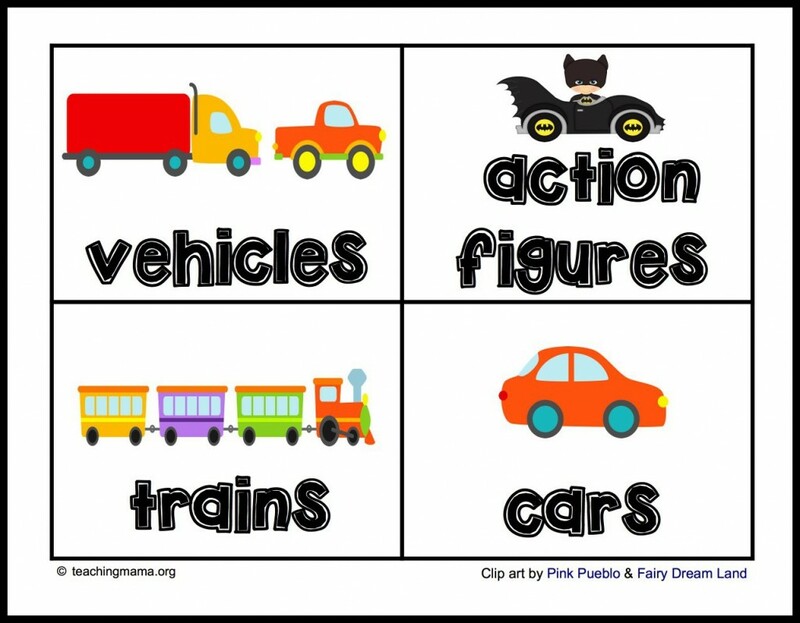 I can edit the words, but can’t seem to find a way to add in additional clip art and would love to have the pictures since my two youngest can’t read yet. Hi! 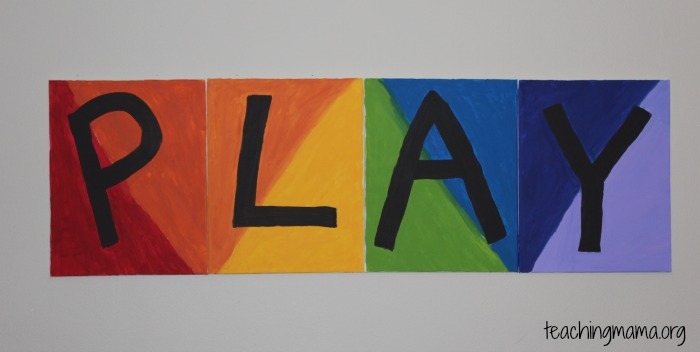 Could you let me know what Font this is or send me an email with the file so I can add other pictures of items we need labels for? I LOVE these! did you get a response as to how to do it? I’m desperate to get mine finished! This looks like Brady bunch font. Thank you so much for these labels!! They are so cute and will save me the job of making them! I found your blog while trying to find labels to organize our bins. Thanks for sharing!! I see you have the same Batman imaginext series. What do you do with the figures and all the accessories? In a bin too? We were given this as a gift and I’m so grateful but it needs a home!! My boys love the Batcave!! 🙂 We just have a little bin next to it that we keep the accessories. Nothing too fancy! We were also given this as a gift, which was a blessing. They aren’t cheap! 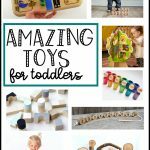 Hello- so i love the toy labels- perfect for any setting! i am trying to edit the last 4 that you added but i just cannot do it. when i do it changes the font. i don’t know what i am doing wrong. any advise? i love them and am desperate to use them but like it seems everyone else- i want everything to match – who knows why! thanks for responding so quickly. i use safari and firefox and both don’t want to work for me. can i purchase them somewhere on your site? Love these labels! I’m trying to add a picture to the last labels to make my own, it wont let me input a picture, any tips? These are perfect and saved me so much time. The labels look great in my day care room. 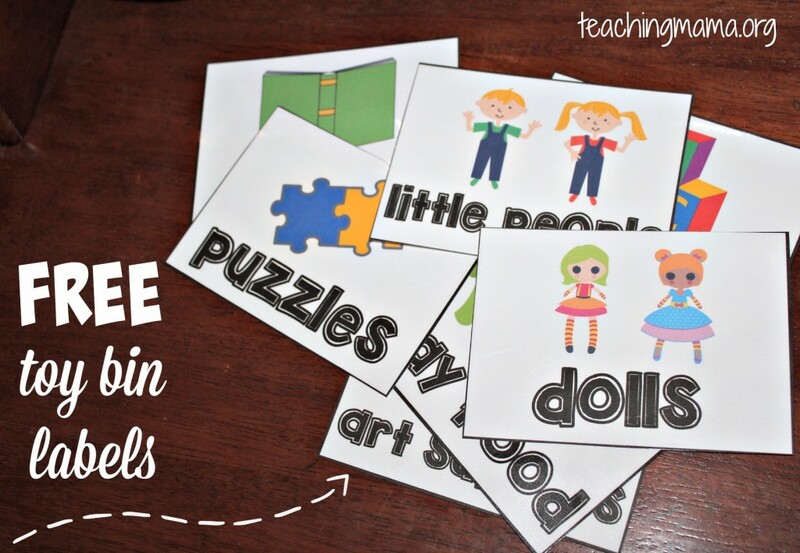 Thank you for sharing them so everyone can use them. I LOVE these labels!! 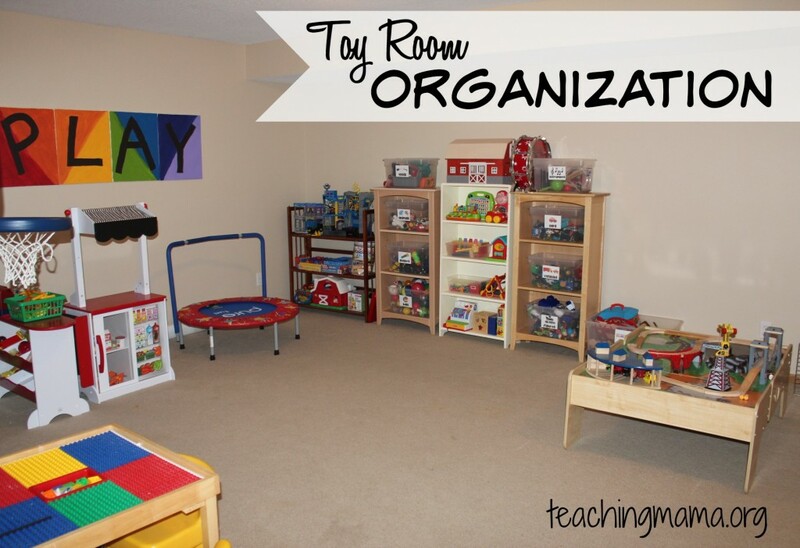 We are currently trying to organize the chaos that is our playroom. Do you happen to have a label for Mr. Potato Head or Crinkle Blocks? I am not able to edit the labels. Thank you so much for sharing these!! Where did you purchase the grocery store? I can’t find it anywhere! It is a KidCraft brand. I just looked online and I don’t see it for sale anymore. I’m sorry! If I find it, I’ll let you know! I would love to use the editable version, but how do you add pictures to it? I LOVE the wooden barn! What brand is it? This is great. Thanks for the inspiration! I’m organizing now after a big move from overseas. 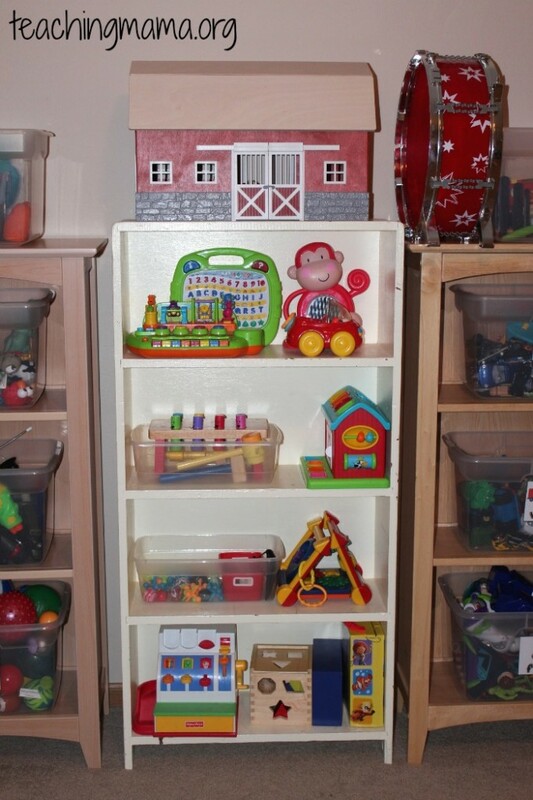 We obviously brought with us more toys than our playroom can handle, and there’s no option for transparent bins, unfortunately. So I’m doing my best to mark all the right places. I’m thinking about non-captioned stickers, though. 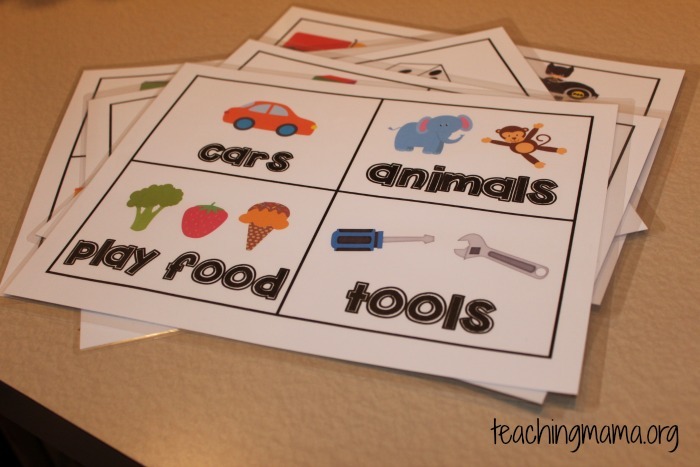 Did your kids were literate already when you made those? Did they use them to read? Thanks so much for your insights! Hi! I’m glad these are useful to you!! No, my kids were not literate when I made them. That’s why I used the pictures. They seemed to remember fairly easily! I’m so sorry! Are you opening this in Adobe Reader? Make sure to download it to your computer before typing in the fields. Let me know if that doesn’t work! Ok, I am so not trying to sound obnoxious or anything, but is that a normal amount of toys for just two kids? Obviously three now, with Lincoln being older. I’m thinking we must have just always lived in small houses which means our toy population is rather sparse…think Sahara Desert sparseness. Absolutely amazing organization, by the way. 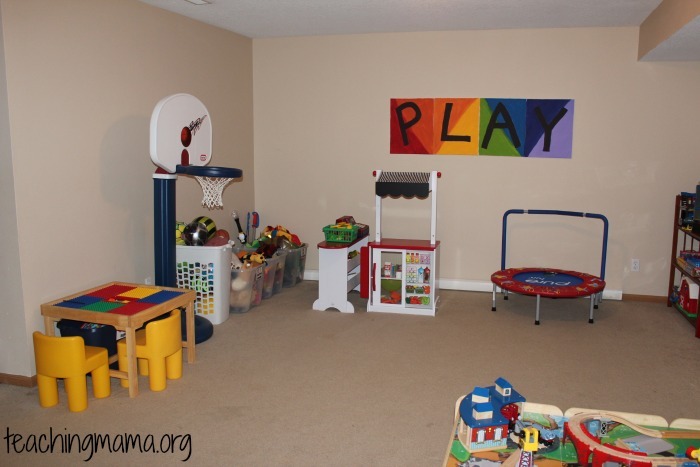 It makes me want my own play room! 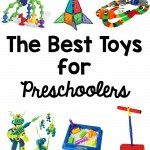 Because of toy sparseness, however, we are having TONS of fun with your many sensory activities! Thank you! Ha, well I don’t know if it the normal amount of toys. My mother-in-law gifts us with lots of toys she finds at Goodwill! I promise we have hardly bought any of those toys. We have donated many of them after my kids stop playing with them. Anyway, thanks! I would really appreciate the editable version of the template so that I can change the text please? Hi Jane! You should be able to edit the template. Email me at angela@teachingmama.org if you can’t get it to work. Thanks! I can not even begin to tell you how AWESOME you are! I truly mean that! My daughter’s room is an absolute joke with all of the toys she has that it gives me a slight panic attack every time I walk in there. 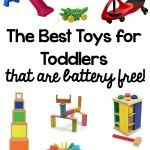 I am SO glad they are editable so we can make them fit our toys! Thanks so much, you put some sanity back into my life! Thank you so much for these amazing bin labels!